Aug. 30, 2018 | 8 a.m.
A 1917 cartoon portrayed then-U.S. Senator Robert M. La Follette, Sr. as a traitor for opposing American involvement in World War I. World War I was a defining moment for the United States. Soldiers shipped out to the Western Front, many more people took on unconventional roles at home, and Americans across the board were forced to make compromises in daily life. Wisconsin stood out, though, in a few ways as the nation entered the war in 1917. It was anecdotally known as the "traitor state," as nine of the state's 11 U.S. representatives voted against going to war. One city in particular illustrated how much views on the war could be polarized: Milwaukee. Wisconsin's most populous city had long been home to a large population of German immigrants and their descendants, and was one of the nation's biggest centers of German-American culture. Milwaukee was likewise the home of U.S. citizens known as "hyper-patriots" who made it their mission to force out any trace of German Kultur in the city and force upon their neighbors a love for Uncle Sam. This story of the city's internal conflicts in the Great War was told in an October 28, 2017 presentation for World War 100: A Centennial Symposium. Recorded for Wisconsin Public Television's University Place, the talk brought together three historians who detailed the role of patriotism during the war in Milwaukee. Rick Pifer, a retired director of reference at the Wisconsin Historical Society and author of The Great War Comes to Wisconsin, explained that despite the "traitor state" label, plenty of Wisconsin political leaders were determined to prove their patriotism by supporting the war effort. The first example of this came during the 1917 draft, Pifer explained. Fearing that draft riots would break out in the state because of its sizeable German-American population, the military offered to supply troops to maintain peace on registration day. Then-Gov. Emmanuel Philipp, however, declined the offer. Without incident, more than 218,000 Wisconsin men registered for the draft, fulfilling requirements and then some. This rise in patriotism, however, came with a dark side. As Leslie Bellais, curator of social history at the Wisconsin Historical Society, noted, hyper-patriots made an aggressive effort to clear the state of its unpatriotic reputation. These hyper-patriots were typically business leaders and other white-collar professionals, and as Bellais explained, they were not people who were used to having their authority questioned. When they wanted something done, it got done, whether this was pressuring neighbors to buy Liberty Bonds or forcing housewives to sign the Food Pledge, which stated that all "patriotic" men and women would voluntarily restrict their food usage so that the soldiers overseas were always well fed. Efforts by the hyper-patriots to enforce support for the war were particularly rampant in Milwaukee. Along with being heavily German-American, the city also happened to be governed by a Socialist mayor — it was the home of "sewer socialism" — whose party opposed the war. Kevin Abing, archivist at the Milwaukee Historical Society, explained that despite the mayor's political views, Milwaukee rose to answer the calls to support the war effort, partly because the hyper-patriots did not allow for any gray areas. As for the German Americans living in Milwaukee during World War I, they faced a particularly uneasy situation. "If they did not enthusiastically support the war, they were deemed unpatriotic," Abing noted. "But if they embraced the Allied cause, they were suspected of being hypocrites." During World War I, many German Americans in Milwaukee and beyond shed or changed their last names in attempt to free themselves of the often toxic social climate they faced. Within the first four months after the U.S. declaration of war, 250 people reportedly abandoned their German familial names. Additionally, the number of German language teachers in the Milwaukee dropped from 200 to one during the war. German Americans weren't the only people feeling pro-war pressure in their communities. Socialists, religious leaders and the Milwaukee labor movement were all subject to harassment and intimidation from the hyper-patriots. Factory owners saw any attempt by workers for improved pay or conditions as pro-German plots to disrupt industrial capacity. Troublemakers were quickly silenced by government agents. Wisconsin's "Yankee population," residents who hailed from New England or New York, were those most likely to become hyper-patriots. They used U.S entry into World War I to reinforce their definitions of patriotism and loyalty and impose them upon other Wisconsinites. 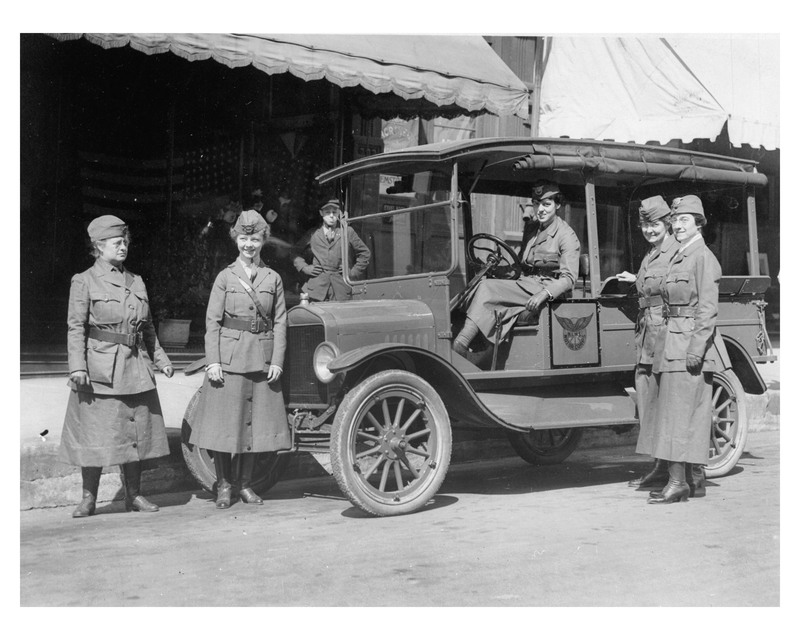 Milwaukeeans participated in home front activities during World War I, including the Motor Corps of the National League for Women's Service. Milwaukee was a center of the socialist movement in the U.S., which elected officials to multiple levels of government. The city was governed by a socialist mayor, Dan Hoan, and was also the home to one of the Socialist Party of America's heaviest hitter, Victor Berger. The latter is known for being the first socialist elected to the U.S. Congress. In February 1918, Berger was indicted by the federal government and convicted on charges of treason and sedition. One of the most outspoken hyper-patriots of Milwaukee was Wheeler Bloodgood, a lawyer from Dutch New York. In March 1917, Bloodgood founded the Wisconsin Defense League — whose name was later changed to the Wisconsin Loyalty Legion — in attempt to dispel any notion that Wisconsin was a "hotbed for sedition and disloyalty." Bloodgood famously asked the federal government to impose martial law in Milwaukee if Hoan won the April 1918 election. Bloodgood's demands, however, were not met. Pifer explaining how Wisconsin became known as the "traitor state": "The people of Monroe, Wisconsin voted overwhelmingly against going to war. Wisconsin's prominent Socialist Party rejected participation in any way [in] the capitalist conflict. Nine of Wisconsin's 11 [U.S.] representatives voted against the war. Senator Robert M. La Follette led a filibuster to prevent arming American merchant ships. He was one of six senators to vote against the war. He lead opposition to conscription, the sale of bonds to finance the war and repression of free speech. Everywhere they looked, the Wisconsin Loyalty Legion believed they could see ample evidence of disloyalty, sedition and unpatriotic behavior." Pifer on Wisconsinites accepting U.S. involvement in World War I: "Without fuss or fanfare, 218,700 young men registered for the draft in Wisconsin, 106 percent of the number estimated as eligible. On the home front, activities such as food conservation provided one of the most universal ways in which civilians displayed their patriotism and support for the war effort." Abing on Milwaukee's commitment to supporting the war: "[Milwaukee] easily fulfilled the city's draft quotas and they oversubscribed its allotments in all four Liberty bond drives by millions of dollars. Milwaukee factories churned out every conceivable product for the military with only minor labor disturbances. Women demonstrated their loyalty by moving into factory jobs, thus avoiding a potentially severe labor shortage, and ordinary citizens planted victory gardens, they did Red Cross work and abided by government meatless, wheatless, lightless and gasolineless restrictions." 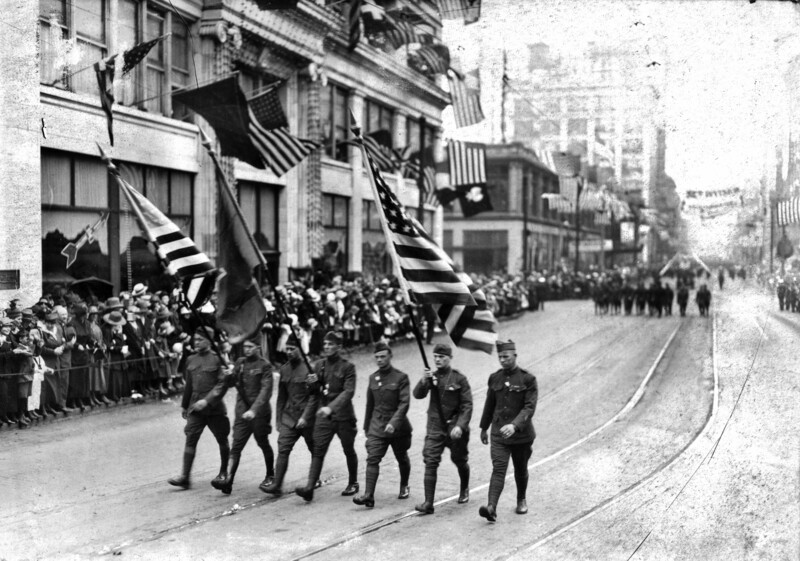 A 1919 parade in Milwaukee celebrated the return of soldiers from World War I.
Abing on the German-American experience in Milwaukee over the course of the war: "This time undoubtedly was a bitter pill to swallow for Milwaukee's German Americans. For years, they had been praised for being industrious civic and business leaders. German theater, music and intellectual endeavors were at the pinnacle of the city's cultural landscape. But the war turned everything upside down. … By 1917, most German Americans in Milwaukee were second- or third-generation Americans and certainly loyal to the U.S., but even those who were natives of Germany recognized their obligation to their adopted homeland." Bellais on the targets of hyper-patriots' attacks: "Wisconsin's hyper-patriots not only attacked German-Americans, but also socialists, pacifists and those who they labeled disloyal politicians. In a way, my thinking is that all of these groups challenged their understanding of what it meant to be American while questioning their right to define Americanism." Bellais on the legacy of hyper-patriots: "Wisconsin's patriots worked tirelessly to put [Sen. Robert La Follette] in his place, though ultimately without success. In the end, Wisconsin's World War I hyper-patriots have not been remembered as true patriots if anyone remembers them at all. Instead, it's their enemies, [Victor] Berger and La Follette, they're the ones who have been honored and frequently treated as the true emblems of American ideals." Abing on the Great War's lasting impact: "The post-war failure of President [Woodrow] Wilson's peace efforts, widespread race riots and labor unrest, the frightening specter of Bolshevism, the onset of Prohibition, and foundering of Progressive ideals all contributed to a sense that the war, a crusade to make the world safe for democracy, fell far short of that goal."